Clémence Beikes from France had been looking forward to the fifth day of action at the FIBA World Championship for Women with a match against Australia. After the game she explained that France played well against the reigning FIBA World Champions and that she and her team-mates were proud with the way they had played despite the defeat to Australia (52-62). The match between the USA versus Belarus turned into an exhibition match as the USA cruised to victory (107-61). Maya Moore scored the 100th point of the game for the USA as she concluded a fast break with a baseline jumper. Sylvia Fowles top scored with 15 points for the USA. Australia and USA will play off for first place in Group E in the final game of the qualification round. Despite the defeat France have also qualified for the quarter-final. The last place in this group will be decided between Belarus and Greece in another winner-take-all match. Canada will now play for 9th place. The four teams eliminated during the preliminary phase have started the classification competition for 12th place in Karlovy Vary. In the first game of the day in Ostrava, Greece took on Canada in winner-take-all match after their defeats on day 4. The game got off to a slow start with just a trey by Styliani Kaltsidou from Greece during the first three minutes. Kristie Philips used all her weight to force her way to the basket to get Canada off the the mark and Chelsea Aubary fired in a shot from the land of many. Yet scores from Evanthia Maltsi and Pelagia Papamichail kept Greece in control (8-5) with six minutes played. For the rest of the quarter both teams missed shot after shot. Jordan Adams hooked in a shot on the buzzer for Canada (7-12) for their first basket in more than 6 1/2 minutes. Motivated by the buzzer beater Canada started the second quarter more aggressively. Despite poor shooting they completed an 8-0 run to lead briefly (13-12) after 13 minutes. The two teams traded basket for the next four minutes with Greece regaining the advantage (19-18). Olga Chatzinikolaou put Greece back in control with back to back scores. A rainbow trey from the top of the arc by Dimitra Kalentzou (right) enabled Greece to go into the interval leading (28-20). Afterwards once again both sides were slow out of the blocks and we had to wait for over a minute before Kalentzou connected with a shot from behind the arc to complete a 10-0 run (31-20). Teresa Gabriele, the Canadian captain, took things into her own hands as she tried to get her team back into the game as she ended her team's barren spell. But it was not until the 24th minute before the game finally took off with shots flying in from all over the court from both sides. Greece maintained their advantage (42-29) with just under three minutes to play. Canada started to play more aggressively and brought the deficit down to under 10 points briefly after a trey by Kaala Chapdelaine. Canada did not give in and Kimberly Smith hit a trey on the buzzer (37-44) to keep Canada in the game. Smith got the final quarter off to an electric start with a trey from the top of the arc with the first shot of the quarter. However Kaltsidou responded in kind for Greece. The game became more physical and rather scrappy. Yet Greece with good defending managed to stay in front (52-47) as the game went into money time despite the tree-point shooting from Canada. Gabriele hit her team's 8th three-pointer to make it a two-point game with 90 seconds to play (50-52). With 30 seconds left to play Canada trailed by a single point (52-53) and had Greece on the back foot until Papamichail hit the shot of the match to give Greece the advantage (55-52) with 14 seconds left. Allison McNeill called a time-out and set up a possible three-point play. The Greek captain Kalentzou knew that they could foul once so she did not to stop the Canadian play. Canada still had 12 seconds left to save the game but were forced to switch the play. Chapdelaine was given the ball but rushed her shot which bounced off the rim. The Canadians tried to save the situation by fouling Chatzinikolaou. Unfortunately for them she hit the two free-throws, which secured the win for Greece (57-52). With this defeat the FIBA World Championship dream for Canada is over. Smith was the leading scorer with 10 points for Canada while Papamichail led Greece with 12 points. Maltsi and Kalentzou both had 10 points each. Greece knocked in 11 three-pointers to 8 from Canada. 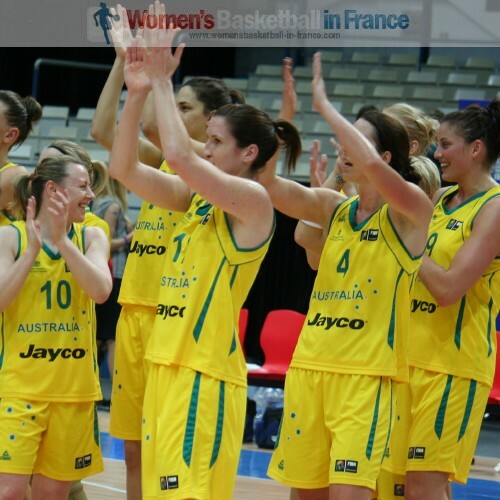 By clicking on the link, you can read the report of Australia beating France (62-52). Australia were made to work hard by France and had to thank Lauren Jackson and Penny Taylor for the victory. In the last game of the evening the USA crushed Belarus (107-61). Belarus lasted just three minutes in this match (6-6). The USA then went on an 18-0 run and never looked back after winning the first quarter (37-11) with a 71% shooting percentage. The game as a contest was over by the interval (58-28). 11 players from the USA scored, with five of them finishing in double digits. Sylvia Fowles led the way with 15 points, while Diana Taurasi and Candice Dupree contributed 14 and 12 points each. Swin Cash and Maya Moore finished on 11 points. For Belarus Marina Kress was the top scorer with 10 points. The USA will face Australia in the match for first place in the group. Spain and Russia remain on top of the group with perfect records after defeating the Czech Republic and Korea respectively. Spain had to wait until late in the third quarter before taking command of the match against the hosts, the Czech Republic. Leading (60-53) going into the final quarter, Spain then kept the hosts scoreless for almost eight minutes while scoring 15 points. Amaya Valdemoro scored 25 points for Spain while her team-mate Sancho Lyttle continues to impress at the FIBA World Championship for Women with another double-double, with 18 points and 19 rebounds. Russia's unbeaten series continues after winning against Korea (81-48). 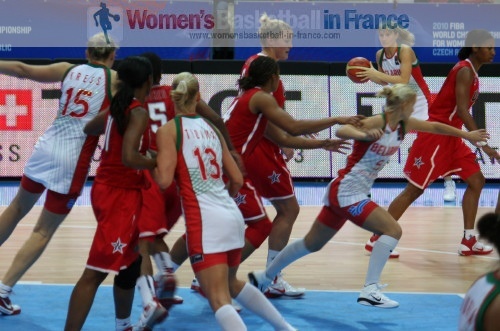 Russia struggled for the first 20 minutes and went into the locker room leading (31-28). After the break the Russian team went to work and blew Korea away with 52-20. Maria Stepanova was the leading scorer with 14 points for Russia. Brazil overcame Japan in overtime (93-91) and now have a chance to qualify for the quarter-final. Erika de Souza (right) scored 32 points for Brazil, took 18 rebounds and blocked 3 shots. Her most important block came at the end of game when she stooped Yuko Oga from taking the game into double overtime. However it was Iziane Castro Marques' three-pointer with 12 seconds left to play to put Brazil in front for good. Depending on the final results, a calculator may be required to determine which one of the two teams are eliminated.